India’s e-commerce business is set to grow from US $50 billion in 2017 to US$100 billion in 2020 according to a recent estimate! A part of this success must be attributed to m-commerce or mobile shopping. Mobile e-commerce is complementing the online retail industry perfectly and India has become the second largest smartphone market after China. The country had a whopping 450 million internet users in 2017, so the potential can be easily recognized. E-commerce websites come in many different forms and there are many ways to get one set up. So what are some typical costs? It's not an easy question to answer but here's an overview. What are your specific business specific needs? What expert help is available for you? A hosted platform is a piece of software that runs on someone else’s server. More often than not, you won’t have access to the code that runs your site. Shopify and Squarespace are good examples of this approach. A self-hosted solution is a software that is run on your own machine. You create and see the code and are responsible for uploading and updating it. If you are having any technical problems you are the one who has to sort it or ask someone to help. Think of the Minimum Viable Product (MVP) model. This means starting with a basic version of your website. At this stage all you need to worry about is selling to the customer. This helps minimize risks, saves money on unnecessary add-ons, and ultimately lays the groundwork. By starting with a basic, bare-bones approach, you can launch earlier, which means you gain operational experience and gather customer feedback earlier. This will help you figure out the apps and new functions your website actually needs. You can set a free domain on WordPress if you have limited funds while starting-up. You can also look into services such as Godaddy.com or hostgator.com. These providers offer basic website creation and hosting services at competitive rates, along with logistical and technical support. They also help with different aspects such as product catalogs, seller support, customer support, payment gateways, logistical services, etc. You must, absolutely, make sure that your website is mobile friendly! What you do need to know is what tools to use and how to use them. People in all the age groups (from young kids to old age persons) have started to utilize the online shopping platform. There are no restrictions online. You can view different types of products online. Compare the prices with other dealers. Make wise decisions by choosing a good product/service. Most of the giant online shopping websites provide attractive deals & discounts to overcome the competitors. The growing competition denotes that the e-commerce industry is in the healthy trend. With the rise of smartphones, it is even more convenient to shop on the go. Interestingly, 82% of shoppers who buy in-store research their purchase online first. Mobile e-commerce will dominate the online shopping industry because high volumes of users make purchase orders through their mobile devices only. Our shopping cart development team can offer you the following functionalities. It’s true that there’s no “one size fits all” solution when it comes to quality e-commerce websites, so eventually you’ll want an agency to help you out. In the long run, a professional design agency will help you make money by making your website better and by following best practice. They can help you save money too by setting up your website so that it’s easy to update. 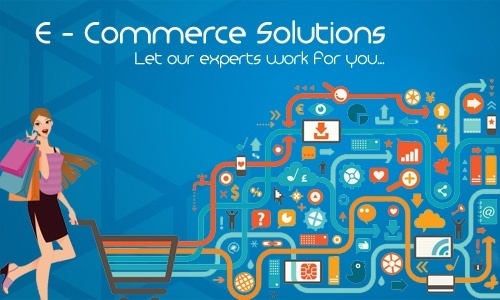 We have a team of professional developers & designers with extensive e-commerce web development experience. We can build custom-made web designs for your business success. Whether you need a basic shopping cart website (usually, for the small retail outlets) or feature-packed e-commerce website (10000+ product pages), we can provide you a complete solution. Our team members are fully-updated in terms of latest technologies and development. Hence we can provide you the complete solution to create an online shopping website. We build corporate websites using various e-commerce platforms such as Magento, NOP Commerce, WordPress, Drupal, etc.